A love story set in a community of cannibals in a future dystopia. In a desert wasteland in Texas, a muscled cannibal breaks one important rule: don’t play with your food. 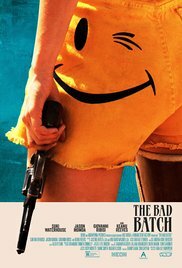 You can say “The bad batch” is an exceptional and eccentric movie. It impressed me the first 20 minutes. An apocalyptic and insane society, somewhere in a desert on the American continent, where unwanted individuals are being dropped. Are you a criminal, an illegal or an asocial person, you’ll get a distinctive tattoo and a hamburger, and you’ll be left behind in the scorching heat in this no-man’s land. That’s what happened to Arlen (Suki Waterhouse). First of all, she wanders around carefree and careless, until she’s snatched by “Mad Max” -like desert dwellers. Not much later, she loses an arm and a leg. She seems to have fallen in the hands of a gang of unscrupulous cannibals, who needed some fresh meat for their barbecue. In addition to their love for human flesh, they are also avid bodybuilders. Does this already sound absurd enough? Wait, there’s more. As an escape tool, Arlen has this brilliant idea of lubricating herself with excrements (probably making her own flesh distasteful), then she knocks down her guard and escapes into the desert with the help of a skateboard. There she’s found by a crazy looking hobo who aimlessly pushes a shopping cart (maybe you’ll recognize Jim Carey). And in that way, Arlen ends up in a commune called “Comfort”. A community filled with normal eating inhabitants, who aren’t so normal afterall and who follow some sort of leader who repeatedly talks to them about “The Dream”. He feeds them psychedelic tablets and he’s surrounded by a harem of pregnant women who are armed with automatic guns. What you’ll see next is a revenge film that slowly evolves into a lunatic, romantic story. Frankly, those first 20 minutes were hypnotic and fascinating. A practically dialogue-free spectacle, full of energy and artfulness with images, silence and a soundtrack which are perfectly complementary. The amputations are horribly realistic. The whole situation is disturbing on the one hand. But on the other hand, it’s kind of absurd and comical. A futuristic created environment. A fantasy created in a film, but nevertheless it’s not unthinkable that such isolation could exist sometime. An appropriate method of removing those who don’t fit into a future society adequatly Unfortunately, this creative level couldn’t be detained and it became a bit too psychedelic and laughable. Even though Keanu Reeves surprised me with his role as a heavily moustached cult leader. He looked like Nicolas Cage while playing in “Arsenal” where he had a similar appearance. Too bad the creative level wasn’t maintained. The moment Arlen starts strolling through the desert hallucinating and completely drugged, while watching a beautiful galactic panorama and afterwards pleased she didn’t arrive in Mexico (looked like she walked quite some distance), the innovative and unique character makes room for something less fascinating. I realize Arlen fights an inner struggle while weighing both worlds. And then there’s also the influence and appearance of Miami Man (Jason “Conan the barbarian” Momoa). An impressive personality causing Arlen to feel something you can call romantic. I also wondered where the “Follow the dream” leader could find the right material to build such a luxurious home. Even a water supply is provided for the indoor pool. I doubt they found all this on the dump. A must-see for open-minded moviegoers? Yet, this was more than successful film to me. And not because of the brutal aggressiveness or the repulsive habits. Perhaps I’m more enthusiastic about the “exploitation” part it all began with. And maybe I thought the psychedelic, romantic part wasn’t that great. But how inventive can you be to provide a soundtrack including Ace of Base, Culture Club and Die Antwoord? Highly recommended, if you are open minded at least. And I bet you’ll feel sorry for the little Honey (Jayda Fink) as well in the end.